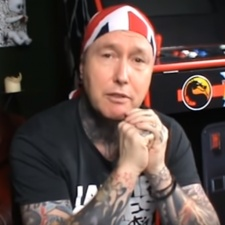 You might remember Dave Perry from his time on British gaming TV show, Gamesmaster. Perry was widely known for being one of the best "gamers" in the country, and his edgy aesthetic paired with his "skill" allowed him to cockily dub himself an icon of the 90s gaming circuit. A section of a Gamesmaster episode made history as Perry failed to complete a level of Super Mario 64. Perry ended up falling off Cool Cool Mountain and sulked on air as host Dominick Diamond ribbed him. The slip-up caused Perry to lose his accolade of 'Games Animal' on the show. Now, the 90s gaming personality is back to revive everything he stood for back during that harrowing time, which as it turns out, isn't that great. In a new YouTube series titled GamesAnimalTV Show, Perry discusses his plans for entertaining fans of old and new. This includes showing off his dusty treasures on camera and revisiting the classic Super Mario 64 level that ruined him 20 years ago. The video can only be watched at 480p, adding to Perry's "authenticity". But it's not his terrible production quality or obnoxious game props that had us reeling. The end of the video features a song written and performed by Perry himself. "Bikini Babes", delivers almost two whole agonizing minutes of Perry discussing how great it is to see scantily clad women in video games. It comes complete with grainy close-up shots of bums and bosoms too. A lot of great things happened in the 90s, a lot of which I am particularly fond of. I'm partial to the PS1, grunge, and obnoxious knitwear. However, casual video-game sexism and objectification can probably stay where it is. Deep in the past. Perry is more than welcome to return to the industry he "cockily presided" over two decades ago, but it would be arrogant to presume that his particular brand of "entertainment" still flies in 2018. It's certainly entertaining, but for all the wrong reasons.